Arriving in Geraldton from years in Sweden, UK and traveling, I was holding a question about “the conditions that are enabling of sustainable human communities. My 5 year inquiry has taken the form of action-learning, contributing to projects and ventures that I (and others) assessed as high-leverage contributions to Greater Geraldton moving closer towards being a sustainable community. And, since 2011 my efforts have been primarily focused on growing Pollinators Inc. In that 5 years, by my assessment, I’ve invested much more in the ‘action’ than then ‘learning’. In the last 2 years Pollinators Inc has grown, gained momentum, and is moving beyond being a ‘startup’ social enterprise (i.e. nearly having a stable business model, with core services mostly independent of grant funding). That growth has taken a big investment of time and energy from a range of individuals and organisations and at times has felt a little…isolating. Strange term to use when we’re growing a ‘community’ that’s very connected, but we have consciously focused on making the enterprise work locally, so the isolation has been relative to the capital city and international networks of coworking, social innovation, social enterprise etc. Now, it seems, the conditions are right such that the best return on investment for myself, Pollinators and Greater Geraldton may be to understand more about how what we’ve been doing and learning relates to other types and scales of human communities. To do this next stage of the inquiry will involve more research and engagement, in the form of conversations and collaborations with those from other regions. It’s likely to take the form of some interviews and podcasts, travel, and even academic research. In this post I’m sharing the focus, scope and nature of the first part of the next phase: an application to complete a Churchill Fellowship project for 4-8 weeks in 2015-16. It seems likely that in mid-2015 I’ll start interviews, conversations and a podcast series with locals and others from across Australia who have experience in this area. Those Australian conversations will set the scene for a wider international scope. Critique, suggestions and offers of support or collaboration are welcome! And, for those regular readers, ‘no’ I don’t count this as something ‘new’ as per my 2015 resolutions! Growing innovation in communities as a contribution to local and global outcomes. Local communities that are deliberately fostering social innovation may create more than good local outcomes: they may have global influence. This project will look at communities (especially smaller city regions) where the success of multiple local innovations has attracted global attention. The intention is to how local innovations emerged and were grown, and if (and how) the global attention has been contributive. These learnings will be relevant for Australian communities seeking to grow innovation ‘ecosystems’. The intended benefit is to encourage more Australian communities to be ‘good for the world’ by growing successful local innovations that also have global influence. If and how these communities have benefited from their global contribution. Application of knowledge in Geraldton, which is increasingly being looked to for its leadership on various social innovations. The project’s intention is that more Australian communities are ‘generative’ i.e. aligning innovation and benefit at the local, regional and global scales. This project focus is on sharing insights into the conditions and characteristics of innovative communities, and on the experience and impact of attracting global attention. This project has emerged due to my experience in a city where deliberative democracy, social enterprise, health, and education initiatives have all attracted some national or international attention. As the success and attention on these individual innovations has ebbed and flowed, questions have arisen including: how to sustain the local initiatives; the balance of resources invested in local, regional and international networks; and how to best present and engage with other cities and regions for mutual (and global) benefit. This project is timely due to Geraldton’s position, and the awareness that other cities and regions similarly aspire to be ‘innovative’ and form ‘alliances’ for local benefit, to share learning and also to gain a competitive advantage in global markets. Thus this project that has emerged from local observations may have benefits to many cities and regions in similar situations, and contribute to a more innovative and prosperous Australia. I say ‘extra’ because through investing in coaching, daily practising and ongoing inquiries, I’m fortunate to have developed some clear values, priorities and guiding principles and values for life…and mostly captured in this little diagram. 1. Refrain from ‘doing’ new ventures (or “Appreciate, grow and harvest what’s already sown”). The positive expression of this intention feels something like “Let go of the idea that you need to ‘do’ something new, which will allow you to be, connect and instead invest in nurturing and harvesting existing people, relationships, skills, practices, projects and ventures”. In support of this resolution, I’ve created a checklist that defines what a ’new venture’ means, and what criteria I will use to assess any new opportunities. I suspect that refraining from new ventures will allow more time, energy and generative relationships that let my best self to shine rather than always giving in to my impatience to ‘do something’ or preference to ‘design something’ (Note: my suspicions about how refraining could be enabling are based on my life experience so far, but also an understanding some of the dynamics of my 5/7 Enneatype e.g. Stressed 5s behave like 7s: http://www.enneatype.com/typefive.html ) I’m particularly curious about the new ways in which I may earn money while ‘doing’ less (projects, consulting, ventures); it may be writing, presenting, coaching, training, facilitating…who knows! 2. Refrain from being paternalistic (or “Discover the most appropriate expression of caring intention”). This means something like continuing to hold and deepen my caring attention, however shifting my expression from: paternalistic “knowing what’s best for others, as defined by me”, towards: mutual inquiry into “what’s enabling of my, your and our best, for all?” (i.e. shared inquiries in the practice of Apithology). Whether it’s relating to my partner, little girl, peers, friends and my community, I can sometimes fall into a pattern (pattern-alistic!) of intellectually deciding what’s best against some implied criteria and then making judgements, interventions or creating enabling structures that aren’t found in mutuality. In 2014 a less paternalistic (and even less martyr-like) approach has already borne fruit, from adopting clear ‘win-win-win-win’ (me, you, us, all) position with my work at Pollinators, right through to having open conversations with my 6 year old about how best to structure meal and snack times to enable healthy eating. A final thought on this is probably an intention to ‘share my working as I’m doing, not just the final outcome’, of which I guess posts like this area an expression! Here’s to 2015 as the best year yet, for all, and forever! A series of events has lead me to think ask a few more questions about men’s health. The events in the last few days included attending a talk on leadership by Geelong football player Harry Taylor, a meeting and related discussions with the men’s group I’m part of, the opening of an exhibition “Tutu for Blue” that is also a fundraiser for Beyond Blue, and my decision to grow a moustache as part of Movember. Enabling men’s health vs. avoiding / repairing men’s sickness? How is men’s health different: from women’s and for men in different stages and circumstances? What / who men’s health is “for”, and what having more healthy men would enable? The distinction between health and avoiding sickness seems important. The first journal article on the field of apithology makes the distinction between pathology as the study of the causes of disease and the apithology as the study of the nature of health its causes, processes, development, and consequences. The priorities and focus for the Movember-funded programs, for example, highlight a range of brilliant and effective interventions that have “a positive impact on getting men engaged and thinking about their health and taking preventative action”. Noticing the focus, I considered what would be the indicators and behaviours characteristic of more men taking “enabling action” of their health and flourishing (instead of / in addition to preventing their sickness)? For example, how different would the focus and content of a conversation about men’s sexuality be if it wasn’t about avoiding trouble/sickness/disease and harm, and instead about what is a healthy, contributive expression of your sexuality? The thought about healthy sexuality lead me to consider how men’s health different from women’s health, or just “people’s” health? A quick look at Men’s Health magazine online vs Women’s Health magazine online is sort of interesting, as they both have very similar focus, suggesting not that much difference between gender’s perceptions of health. This comic about unconscious double standards in inter-gender relations highlights some different dynamics that may need to be considered in health.The other observation from viewing the Men’s Health magazine website, is that what health means to men is going to be radically different at different life/developmental stages and in different cultures: I don’t think their target audience includes boys under 15 or men over 45. For example, the conditions and behaviours that enable the health of a 15 year-old teenage boy at a private school in Perth are likely to be very different from those portrayed in Men’s Health, and of those of a 45-year old father of three living on a farm outside Northampton. Even if the behaviour was the same (e.g. running every morning) the meaning-made and health-contribution may be vastly different (e.g. training hard alone to test the body’s limits and earning peer respect through performance at races in the teenager, and running in a group of the same age making time for social interaction for the father). This sort of consideration would be well-informed by consideration of a adult development models like Graves’, but for me this will simply stand for me as an ongoing contemplation and topic for conversation this month. A further distinction may be about what men’s health is ‘for’. That is, health in its own right is probably accepted as valuable, but with masculine drive, purpose and passion, looking after one’s personal health may be a low priority compared to looking after the health of your family, business or otherwise. I think this is where consideration of the coaction of individual men’s health and their context is critical. As an example, my own physical health really becomes a priority where it obviously contributed to better work performance, personal relationships or enabled a new kind of contribution to my community (or humanity). At times, I’ve seen time spent exercising, meditating or journalling as ‘wasted’ because I couldn’t see how it contributed to other priorities. To use another example, it’s easily understandable that if the meaning one makes from life is being a good family provider (money, food, shelter), good mate (beer and bbqs with the boys), and good worker (focus, self-sacrifice, and doing extra hours); then your personal physical health or emotional wellbeing could be perceived as a very low priority…until something catastrophic happens. It seems that any conversation or action to enable individual men’s health probably needs to consider how that man’s health could be meaningful in terms of their existing (or aspirational) self-identity, community contribution or realisation of their own purpose or passion. This TEDx video considers something along those lines, re-defining what it means to ‘be a man’. That brings me back to the distinction about enabling health rather than preventing sickness. It seems any conversation about Men’s Health could benefit from the stories of people whose personal, physical, mental health was enabling of the health of their families and communities, and perhaps that of humanity. Rather than leave men alone to deal with (or ignore) their own suffering, imagine if we were consciously considering the conditions that were enabling of men’s health, healthy development and health-enabling contribution through every stage of their lives! That sort of conversation about alignment, integration and enabling is very different from that about diets, stress and prevention. I’m looking forward to this month of mo-growing, contemplation and conversation, to see what insights and learning I can glean…that may enable my health, others, and humanities as a contribution. An interesting bus trip. I really love trains. I am not nearly as fond of buses yet I still highly recommend them as a way to travel long-distances, cheaply and without having to drive. I have fond memories of: adventures on Greyhound buses during a West-coast USA trip as a child, the beautifully decorated overnight buses through Iran and Pakistan, the “sleeper” buses from Kunming (SW China) into Luang Prabang (Laos), an epic 3+day bus from Pekanburu (Sumatra) to Kuta (Bali), and the joyous Hallbarhet sustainability-conference-on-a-bus through Sydney to Melbourne. Last night’s 12:50-6:30am bus from Geraldton to Perth wasn’t nearly as memorable, but was still enjoyable thanks to already knowing a quarter of the people on the bus (2 of 8) and the fact I could sleep and minimise travel during working hours. I actually also really appreciate just seeing who all the other people are who catch buses – definitely a different crowd to the airport or those that drive. Observing a lazy cat. How cool are cats? They do absolutely nothing, yet get treated like little gods. Today, working from home at my parent’s house, I noticed one of their cats literally did not move 1m from her sleeping spot the whole day. I used to assume this cat would do something when no-one was home, but extrapolating from this cat on this day to all cats on all days, one could easily believe that all cats do absolutely nothing. Nothing. Yet I love them. Observing this behaviour and my affection made me think of running a more cat-liked business or having a more cat-like personality — how to move efficiently, somehow stay fit and flexible, and be loved and showered with affection and food for a lifetime despite being short-tempered, self-centred, greedy and lazy. Being friends with Dr. William J Varey. As far as I can understand, Will’s PhD changes the landscape and fundamental tools across several fields of human knowledge and creates a whole new field (Apithology). Prior to and aside from his PhD Will’s presence on earth has transformed the lives of countless people, and elevated and integrated the practices of already highly-skilled practitioners in several fields (facilitation, natural resource management, urban design, teaching, community development etc.). He’s also a very happy, funny, and almost incomprehensibly generous being. This Tuesday, Will invited me to dinner to celebrate the awarding of his PhD with a few others. Rather than simply have a few beers and celebrate, Will facilitated a “Dedication of Merit” ceremony based on the traditions of his Buddhist lineage. It was the most remarkable dinner ever had involving great food, great people, and a greatly delicate and heart-expanding series of blessings, dedications, songs, openings and closings. Will always leaves me lost for words. The only more I can say is if and when my gratitude to him is adequately expressed, the benefits of his presence on earth should touch a great many more of your lives. This is a little story about how a slight shift in attention, intention and a question could change your life, and be helpful to others. If you go to the Dentist they will tell you to floss your teeth. While at a visit to the dentist one year ago, I really listed to this advice and set an intention to floss regularly. Making that decision and articulating that intention immediately lead to arising of some questions about conditions enabling of flossing, which lead to questions I asked of my dentist. I asked him about it’s benefits, how flossing works, what is the necessary frequency, the best technique? In responding to my questions he revealed that very few people actually floss, even though he tells everyone to do so, every visit. That is, he tells up to 80 people a week or 5000 people a year to do something that ‘none’ of them actually do. 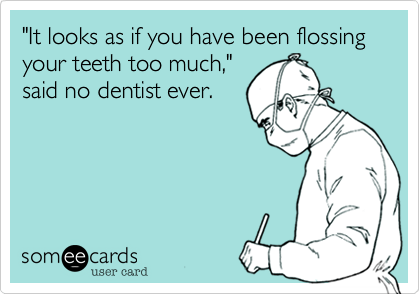 So this dynamic of ‘not flossing’ is not really just ‘my’ issue alone. It seems to be a challenge shared by many people with teeth, a few of them who make a living from dealing with bad teeth, and probably a few who need to allocate taxes or raise insurance policies to deal with rising dental costs. So how did I approach this challenge of flossing? Pausing whenever I noticed the thought “I can’t be bothered flossing” — This second or two of pausing was usually enough to allow my ‘better’ self, intention and rational mind kick in and at least create the possibility that I would make a different choice from the habitual non-flossing. Now, because my kitchen is very small and the same space as the bathroom, my dishes are done in the same area as teeth-flossing. So the flossing inquiry lead to an inquiry about why the dishes pile up. Similar inquires, observations and adjustments (e.g. removing the shelf that seemed to only exist to accumulate dishes that could just be washed in 10 seconds) were made. Now my teeth are regularly flossed and my dishes don’t pile up. The evidence of this change are the absence of things rotting in my teeth, absence of unwashed dishes and absence of an obstructing shelf. So, a minor victory for me and a cool little story to tell the Dentist. Interestingly the Dentist didn’t really have much of an interest in my story when I went to visit this year, and I couldn’t really tell it because he had his hands in my mouth. He did, however, take my mention of it as a trigger for him to tell a story about how no-one flosses. Some other people WERE interested in the story…. I happened to be having a conversation at the pub where sharing this story and the shift in attention, intention and inquiry was possible and useful. The conversation going on was about “Why don’t more other people…eat well/exercise more/care for the environment etc.” Funnily, as I shared the story all four people around the table gasped with a sense of recognition: they too don’t floss yet want to, they feel they should but haven’t, they too have floss in their bathroom cupboard but it’s up the back and ten years old, they too thought it would take forever and make them late for work. It seems sharing that story and inquiring mind was enabling of others and their own change in behaviour. A couple of these friends also suggested that this shift in approach could be useful for other habits they too were trying to change. From this little story I think you can imagine the potential for a different approach/attention/mind to something very trivial and everyday to actually have much wider interest for a single person’s life, or the lives of thousands of others who are stuck in similarly undesirable patterns of not-flossing, not-eating well, not-exercising etc. And in this particular case, even though there may be split incentives for dentists (more decay = more work), I can’t help but wonder how a few simple inquiries (rather than instructions or directives issued to a person who can’t engage in a conversation because you have your hands in their mouth) may increase the percentage of people who floss, quite dramatically. If only our dentists were as interested in our conceptions and the conditions of healthy teeth, as they are in the teeth themselves. All credit for developing a flossing practice goes to Apithology, ZenHabits and Meditation (read this as a nice guide).